Ofcom today (4 August) released its TV, radio, broadband, telecoms and mobile industries report, noting significant changes over the “digital decade” since 2001. Here is the 341 page Communications Market Report boiled down to a list of 30 facts and figures that are relevant to publishers. 5. Most people with smartphones (59 per cent) acquired their device in the past year. 15. The leading blogging site is Google’s Blogger, which reached 8.2 million users in April 2011. 21. 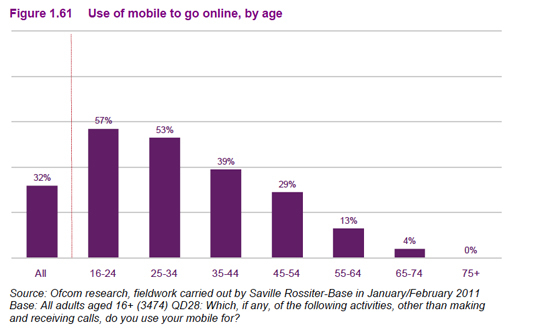 In Q1 2011, 46 per cent of UK adults claimed to use social networking services on a home internet connection. There are signs that the growth of social networking may be reaching saturation point: total time spent on social networking sites was just 1.3 per cent higher in April 2011 than in April 2010. 23. Apple’s iPhone has a 32 per cent share among adults. This is the brand of choice among ABC1s (37 per cent) and is even higher among ABs alone (44 per cent). But BlackBerry handsets have also taken a significant share of the market (24 per cent) and are particularly popular among younger adults and teens (37 per cent each). 27. Nearly three-quarters of internet users shop online. Visitors to coupon and reward sites increased by 25 per cent in the year to April 2011, when nearly 40 per cent of internet users visited at least one such site. 30. Apps downloading is higher among teens than adults; around two-thirds (63 per cent) of teen smartphone users have ever downloaded an app, with one in four (28 per cent) doing so regularly. Six in ten (60 per cent) have paid for an app. 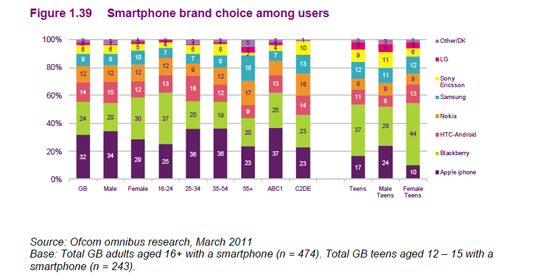 The average maximum amount of spend among teens is £3.70 and the median is £3 – £3.99. See a further 10 facts on mobile media. 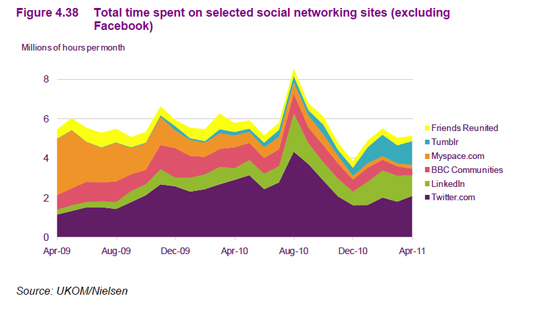 All graphs taken from the Ofcom report. This entry was posted in Advertising, Mobile and tagged blackberry, Facebook, Internet, internet use, iPhone, mobile advertising, Ofcom report, Smartphone, smartphones, social networking time on August 4, 2011 by Sarah Marshall. A report carried out every two years by the Pew Research Center suggests Americans are spending more time consuming news now than 10 years ago. The research, released this week, found that rather than replacing traditional media with digital platforms, consumers spend an additional 13 minutes daily getting news online as well as 57 minutes on average getting news from traditional media such as television, radio and newspapers. In the year 2000 the survey reported a total of 59 minutes was spent by audiences consuming news, with no time reportedly spent consuming news online by respondents until 2004. According to the report, this is one of the highest totals measured since the mid-1990s, which does not take into account time spent getting news from mobile phones or other digital devices. 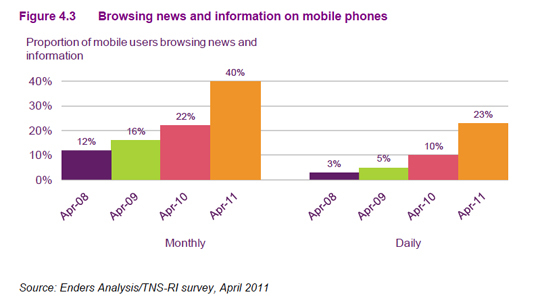 Only eight per cent of respondents get their news from their mobile. The news consumption survey recorded the responses from more than 3000 adults from 8 to 28 of June. Other findings include an increase in ‘news-grazers’ who consume the news on a less regular basis from 40 per cent in 2006 to 57 per cent in 2010. The survey also found an increase in the use of search engines for news gathering, rising to 33 per cent from 19 per cent in 2008. See the report in full here.. This entry was posted in Editors' pick, Mobile, Newspapers, Online Journalism and tagged digital media, Internet, News consumption, Online Journalism, pew research center, search engines, traditional media on September 14, 2010 by Rachel Bartlett. According to this video presentation by Jesse Thomas, eighty-one percent of email is spam. But if you view the rest of the statistics, you can see how email is becoming rapidly irrelevant as a key communications – and publishing – tool. This entry was posted in Multimedia, Social media and blogging, Traffic and tagged E-mail spam, Information technology management, Internet, Jesse Thomas, Spam, Spamming, World Wide Web on February 28, 2010 by John Thompson. Stuff.co.nz reports that the Australian government’s plan to censor the internet is ‘in tatters’: Australia’s largest internet provider is saying it will not participate in live trials of the system. This entry was posted in Editors' pick and tagged Australia, Australian government, Censorship, Internet, the australian on December 10, 2008 by Judith Townend. In Marc Andreessen’s world the Christian Science Monitor wouldn’t be the only traditional print product going online-only. In this interview in the latest edition of Portfolio, Andreessen, who is co-founder of Ning, Netscape and investor in Digg and Twitter, says the New York Times should cut its print losses and focus on ‘the market of the future’. [Andreessen] Shut off the print edition right now. You’ve got to play offence. You’ve got to do what Intel did in ’85 when it was getting killed by the Japanese in memory chips, which was its dominant business. And it famously killed the business – shut it off and focused on its much smaller business, microprocessors, because that was going to be the market of the future. And the minute Intel got out of playing defence and into playing offence, its future was secure. The newspaper companies have to do exactly the same thing. The financial markets have discounted forward to the terminal conclusion for newspapers, which is basically bankruptcy. So at this point, if you’re one of these major newspapers and you shut off the printing press, your stock price would probably go up, despite the fact that you would lose 90 per cent of your revenue. Then you play offence. And guess what? You’re an internet company. This entry was posted in Newspapers, Online Journalism and tagged Andreessen, Christian Science Monitor, co-founder, Intel, Internet, Marc Andreessen, memory chips, New York Times, Ning, print product, printing press, printing press, The Christian Science Monitor, the New York Times, Twitter on October 30, 2008 by Laura Oliver. Lee Han-ki, editor-in-chief of South Korea’s citizen journalism news organisation Oh My News, has said the proposed legislation to clampdown on online news in the country could stunt the ‘democratic development’ of the Korean press. In an interview with the Guardian, Han-ki said the proposals are aimed at controlling public opinion of news media and repressing free speech. This entry was posted in Online Journalism, Press freedom and ethics and tagged editor, editor-in-chief, editor-in-chief of South Korea, Internet, Lee Han-ki, Lee Myung-bak, media organisations, newly-elected government leader, news media, Oh My News, OhmyNews, online news, public Internet companies publishing news, search algorithms, South Korea, The Guardian on August 5, 2008 by Laura Oliver. Caroline Little, the CEO of WashingtonPost Newsweek Interactive, has resigned from her post, the newspaper’s publisher has confirmed. Rumours about here departure bound round the internet last week, till Post Publisher Katharine Weymouth confirmed the move in a memo to staff. The memo praised Little’s 11 years at the company, but also suggested that the Post newspaper and web teams would move closer together as senior figures in the web team would now report directly to Weymouth. “I am taking this opportunity to move washingtonpost.com and The Washington Post closer to a true Washington Post Media organisation – rather than a newspaper company and an Internet company,’ the publisher wrote in the memo. ‘To that end, Jim Brady, executive editor of washingtonpost.com and Rob Curley, vice president of products, will report to me. This entry was posted in Editors' pick, Jobs, Journalism, Newspapers, Online Journalism and tagged Caroline Little, CEO, editor, executive editor, Goli Sheikholeslami, Internet, internet last week, Jim Brady, Katharine Weymouth, president and general manager, Rob Curley, Steve Hills, The Washington Post, USA, vice president of classifieds and local products, vice president of products, Washington Post Media, WashingtonPost Newsweek Interactive, washingtonpost.com, web elements, web team, web teams, WPNI head on April 14, 2008 by Oliver Luft.